Yeovil Ladies defender Emma Brazell says Wednesday's season opener against Reading at the Madejski Stadium will be a "massive" occasion for the club. The former Premier League Southern Division side are one of 10 teams to move into the second tier of the Women's Super League this term. Brazell, who has been with the club for 18 years, told BBC Somerset: "When I started playing all those years ago it was a bit of a laugh. The 31-year-old continued: "It's so different. 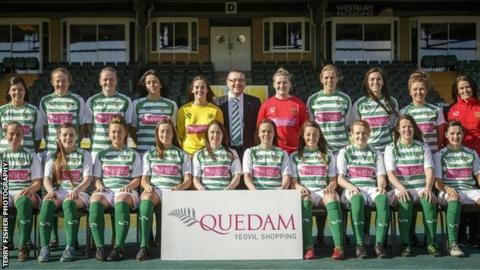 The game is up-and-coming and going places, especially for Yeovil Ladies. "For a little old town like Yeovil, to be able to tell everyone we're playing at the Madjeski stadium is a massive thing for us." The Football Association decided to expand to a two-tier league from 2014 with the hope of increasing competition and growing the game in more areas. Teams can be promoted and relegated between the two divisions but those in the second tier cannot go down. Yeovil, who are based in Sherborne, secured a third-place finish in the Premier League Southern Division last season behind champions Reading and Millwall. Having not played a competitive game for nine months, manager Sarah Lawler says her players are raring to go in WSL 2. "We are really ready for this. We're just so excited and incredibly proud of all our players who have worked so hard," said the former midfielder. "It's going to be hard for us in a new environment but the most important thing is that we compete. We need to go out there and set our standards really high."